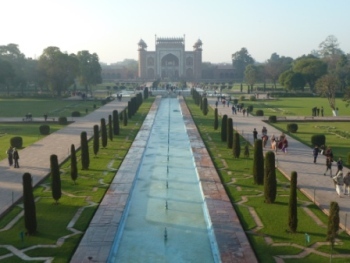 New Dehli, India was sensory overload for us. Everywhere we looked was something unexpected and surprising. 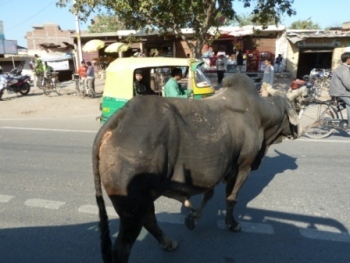 Brahman bulls roamed the streets untethered. 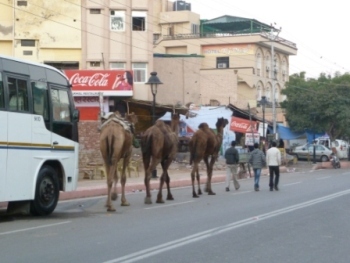 Camels were led to who knows where. 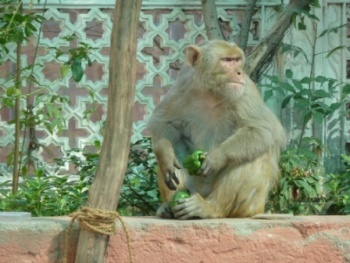 Monkeys sat on walls; while cattle, horses and donkeys shared the streets with motorcycles, carts pushed by people, tuk tuks, bicycles, cars and busses. Marked lane lines were only suggestions and no one seemed to notice them. A three lane road was packed with as many vehicles as possible going in every direction. 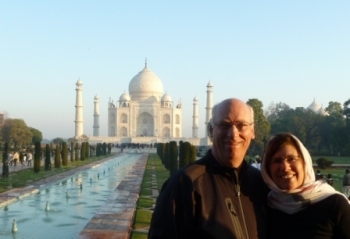 Just after sunrise, we visited the beautiful and serene grounds of the Taj Mahal in Agra, India. 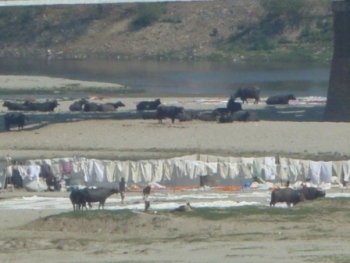 Below the Taj was the sacred Yamuna River where water buffalo roamed and huge amounts of laundry were being washed and dried. 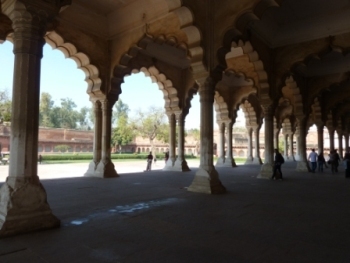 Nearby the Red Fort (a World Heritage site) was nothing like any fort we had seen. 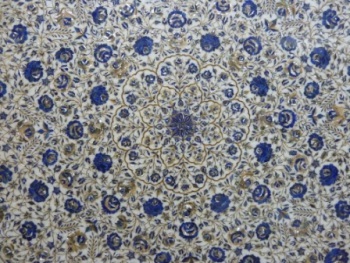 Only 20% of the grounds are open to the public, but we were able to visit several large courtyards and chambers where past sultans lived. 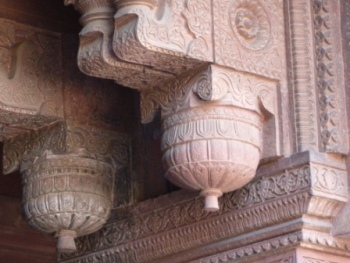 Intricately carved details in stone were on nearly every building surface. 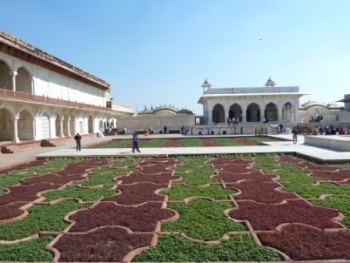 The courtyard of the Sultana (wife of the Sultan) was carpeted in an herb garden. 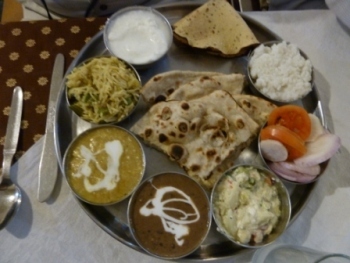 For lunch we had garlic nan bread (center), white rice, Navratan Korma (9 vegetables, pineapple, coconut cream), black & red lentil dahl, spicy chicken curry and plain yogurt. 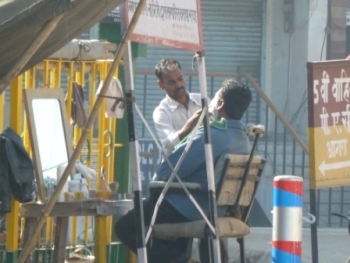 Outside, a barber sat up shop on the street corner. 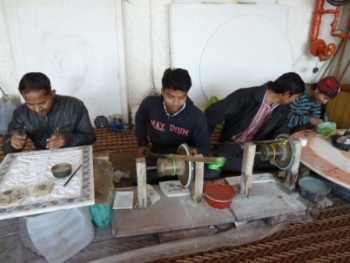 then a Cottage Industry where carpets were made by hand. 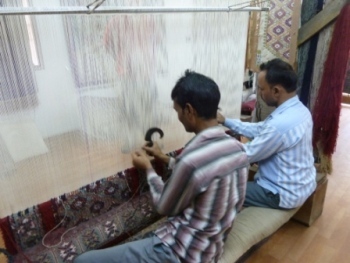 The knotting of each thread is done quickly, but it will take these 2 men all day to add 1 1/2 inches to the 5x7 rug. 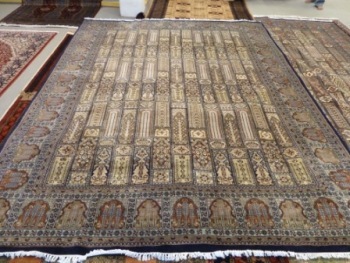 We bought the 8x10 Moghul Garden Design carpet on the right. It took over 3 months to complete. 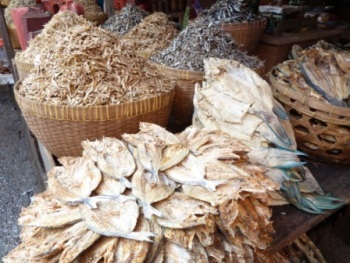 The Andaman Islands are an archipelago off the coast of Burma that belongs to India. 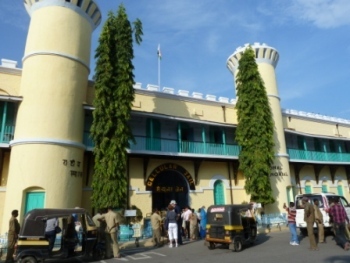 In Port Blair, the infamous Cellular Jail is where freedom fighters were sent in the late 1880s. Several martyrs died of starvation during their hunger strike opposing the cruel treatment. 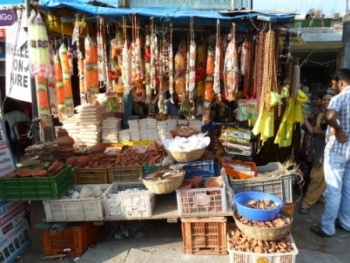 The Aberdeen Bazaar, located near a Hindu temple, sells clay bowls used to fill with oil and burn as an offering along with other local crafts. Megat Ahmad was our wonderful driver/guide in Langkawi, a Malaysian island in the Straits of Malacca. 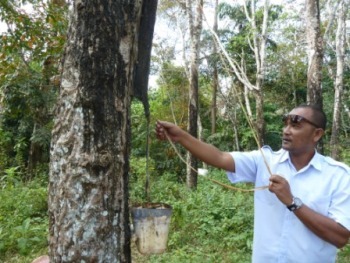 He stopped at a rubber harvesting area and we experienced the horrible rotten cheese smell of the sap. 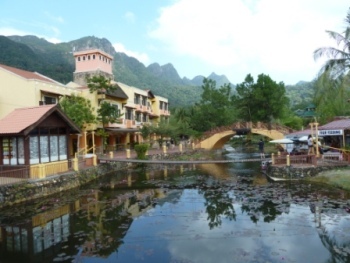 The Oriental Village& Cable Car theme park was set below Mt. Mat Cincang. 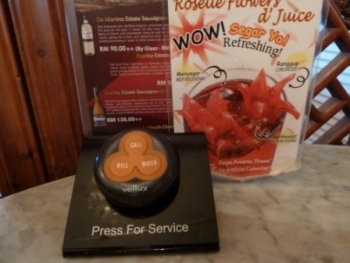 We walked in over the swing bridge, shopped and had lunch. 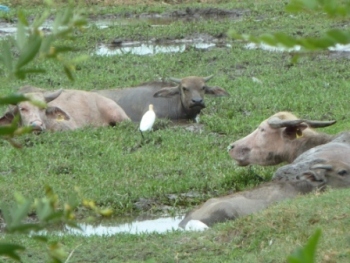 The Laman Padi Rice fields demonstrated traditional methods of rice farming; while water buffalo, which are used to pull the equipment, rested in the watery bog. 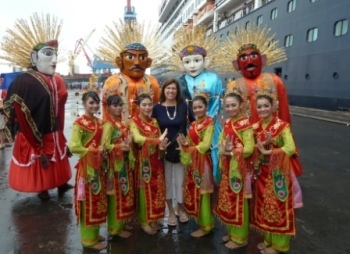 At the Tanjung Priok harbor in Indonesia, our ship was greeted by beautiful, graceful local dancers. 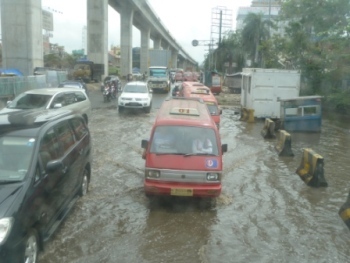 Some streets and buildings were still full of water because of the recent flooding. 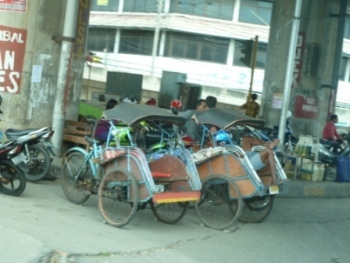 Trishaws were available everywhere and didn't stall out in the water. 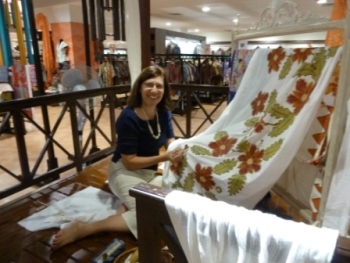 Vicki was able to get a lesson in the art of Batik drawing. No, these are not chocolate covered peanuts. 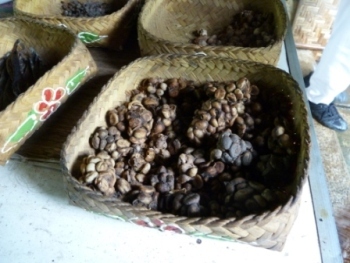 It is the spoor of Civet Cats; which is cleaned, roasted & ground to make Luwak coffee - the most expensive coffee in the world. 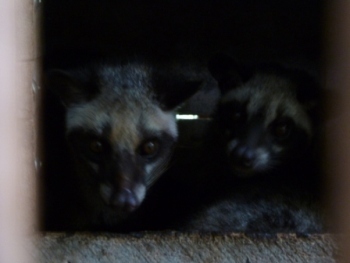 We saw these nocturnal animals in cages and were able to taste a cup of their expresso-strong "by-product" for only $5 a cup (normally $30 a cup in the USA). 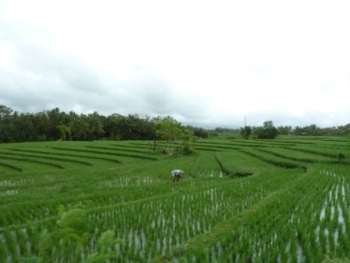 Rice fields were all over the island of Bali. 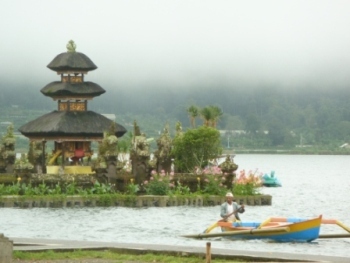 So were many family and public Hindu temples including the Bedugul temple near the Botanical Garden. 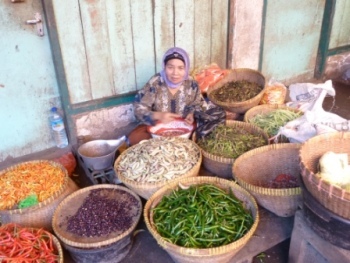 The island of Lombok, Indonesia is mostly Muslim and much less touristy than Java or Bali. 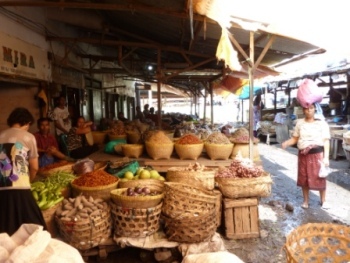 We spent time at the largest daily outdoor market watching the people and asking our guide, who spoke limited English, what people were selling and doing. 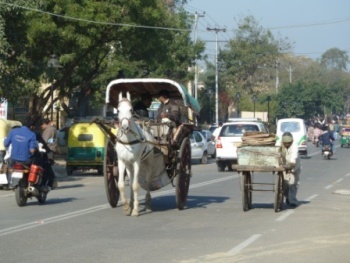 Many people came from long distances by foot or horse drawn cart. 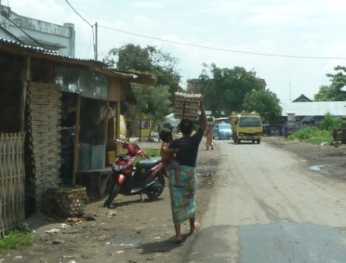 This woman was carrying her baby and crates of eggs back to her house in the 90+ degree heat and humidity. 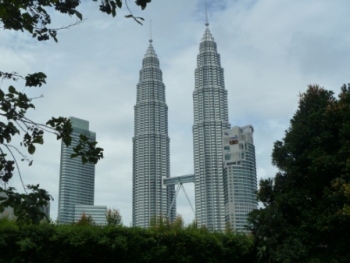 Mostly we just experienced the smells and sights that were unlike the clean, air-conditioned malls and grocery stores at home. 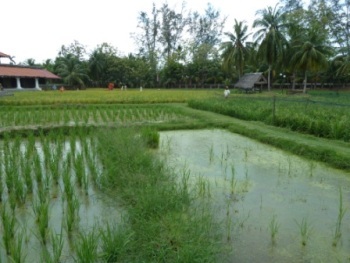 We had an exciting opportunity on the island of Sulawesi. Our group of 15 were invited to visit a rural community, Lakkang, only accessible by water. 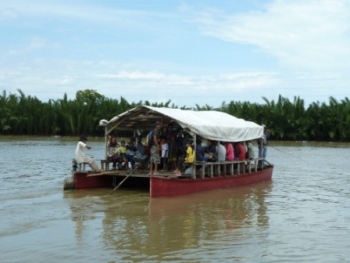 There are no roads to the village, so we took a 20 minute ride upriver on a pincara boat, which is essentially a double canoe covered with a wooden platform. Life preservers?! Are you kidding?! 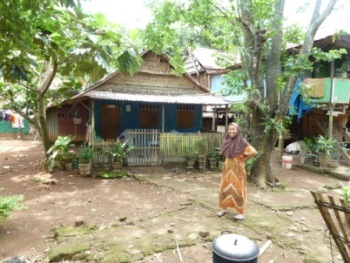 We realized that we were probably the first "tourist group" to enter the village. At first the children seemed afraid of the "white people". Only our 2 guides spoke limited English. We were invited for lunch at one of the nicest houses and asked to remove our shoes and washed our feet with water from the green pot near the stairs. 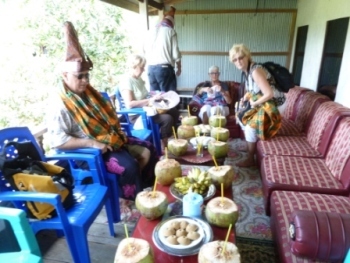 After we climbed to the verandah, we were each given a coconut and had appetizers of bananas, steamed buns with coconut inside and rice cakes. Then we entered the main room where we sat cross legged on the floor to eat with our fingers. 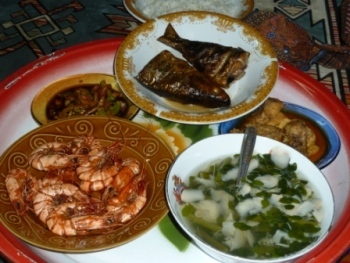 The women of the house watched us to see if we approved of the feast that they had prepared; so we tried to react happily to the locally grown meal of shrimp, fried fish, bamboo shoots, and chilies. We pretended to forget that there is no running water or indoor toilets for sanitation in the village. 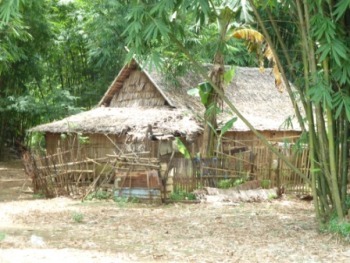 More modest homes were not on stilts and made of sticks and thatch. Chickens and goats roamed freely. This woman really wanted me to take her picture with her home. When I showed her the digital image, she loved it. 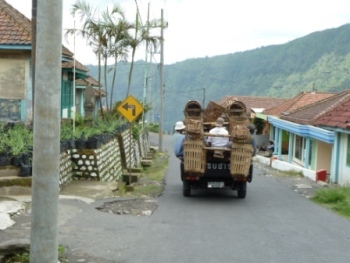 Our jeep took us high into the mountains from the port at Probolinggo on Java Island. One of the jeeps in our caravan broke down. But with a quick repair using clear Scotch tape on the electrical wires, we were back on our way past highland villages and cool weather crops. When we arrived at Mt. 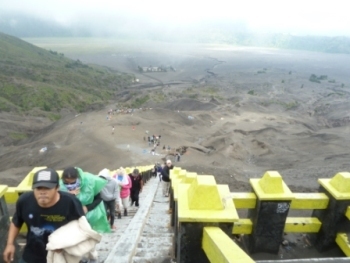 Bromo we had a choice of riding horses or walking to the mountain top. People were bundled up against the wind and cold temperatures. 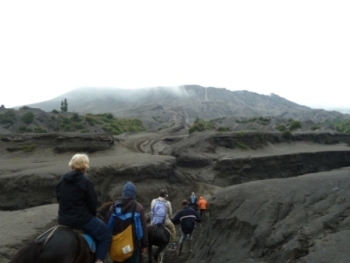 The barren, 2 mile trail of sandy, volcanic ash took us through washed out gullies and straight up the side of the smoking volcano. When we reached the top of the 226 stairs, we looked back to where our hike began way out in the valley. 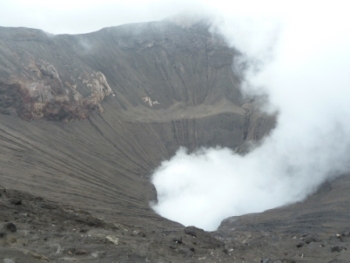 As we peered down into the caldera, the wind blew the sulphurous smoke away from us.